Amarinder Singh said he and Sunil Jhakar told the party leaders that the Punjab Congress will go solo and win all the 13 Lok Sabha seats in the state. 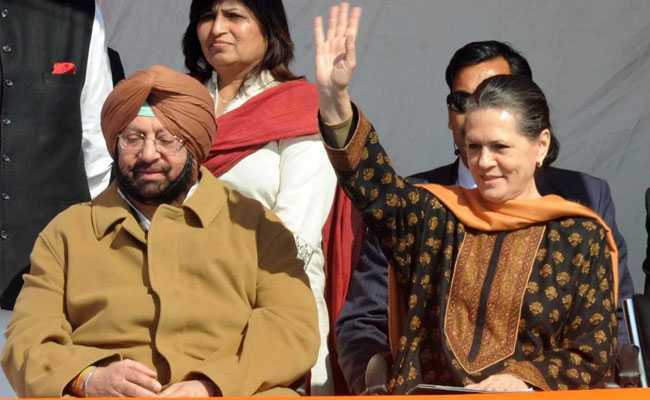 The Punjab Congress on Wednesday told the party's top brass that it did not need any alliance in the state for next year's Lok Sabha elections and it would win all 13 seats on its own. Chief minister Amarinder Singh conveyed the view to the Congress' alliance committee. Party matters, particularly those related to the upcoming Lok Sabha elections, were discussed during the meeting, Mr Singh told reporters. Senior Congress leaders including Ahmed Patel, A K Antony, Jairam Ramesh, Mallikarjuna Kharge and Ghulam Nabi Azad and Punjab Pradesh Congress Committee (PPCC) president Sunil Jhakar attended the meeting. As far as a national alliance is concerned, it was left to the party high command to decide, he added. The chief minister told reporters he had informally taken the views of his cabinet colleagues on the issue after a meeting earlier in the day and "all were unanimous that no tie-ups were needed and the party would win the Lok Sabha polls in Punjab hands down". Asked about legalising cultivation of opium in Punjab, he said he was against it and would not allow drugs to ruin the state. "No matter what AAP MPs or others say, we don't want any drugs to be grown in Punjab," he said. Suspended AAP MP Dharamvira Gandhi has been batting for legalising cultivation of soft drugs like opium and poppy husk in Punjab. Amarinder Singh's cabinet colleague Navjot Singh Sidhu has reportedly backed the demand. Responding to a question about the Centre's notification that includes Chandigarh DSPs in DANIPS (Delhi, Andaman and Nicobar Islands Police Service) cadre, Mr Singh reiterated that his government will not allow dilution of Punjab's stake in the union territory at any cost. His government, he said, had categorically rejected the centre's notification about Chandigarh UT cadre allocation. The chief minister also revealed that he will meet the Union Food Minister Ram Vilas Paswan on Thursday to discuss the cash credit limit and food grain procurement issues. He said he will also take up the matter with Prime Minister Narendra Modi next week.